Axess 2 are back at Grand Designs Live! We are delighted to announce we are back for our second year! Our stand B758 is situated in the Grand Build Area! Our team will be on the stand at various times and will be happy to help you explore our range of lift solutions for your current home or your new Grand Design! The show is the UK’s number one, award-winning home show packed with design and inspiration for your home. 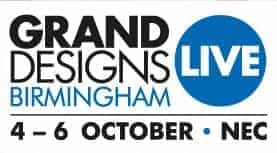 Grand Designs Live is perfect for anyone who has an interest in interiors, build, kitchens, bathrooms, gardens, shopping, food, sustainability and technology. The show will provide you with plenty of amazing ideas to turn your dream home into a reality. Whether you’re self-building, renovating or simply re-decorating you’ll find everything you need for your very own design. The Grand Designs Adaptahaus build, as seen on the Channel 4 programme, featured an Axess 2 Leonardo electric traction lift. The platform lift itself was chosen for its contemporary, design led attributes, combine this with the energy saving and environmental friendly credentials, it was the perfect solution. Looking forward to seeing you all at the show!